Many accounts payable (AP) organizations are still stuck using paper-based processes, which lead to longer payment cycles and less control over working capital. While optimizing processes delivers measurable cost-savings and increases productivity, companies may be resistant to change due to lack of knowledge or lack of desire on the part of end-users. 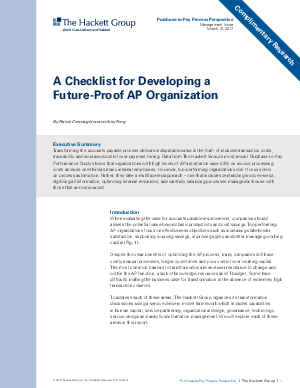 But transforming your AP organization can improve agility and control, support sourcing savings, and more. To help organizations understand the value of digital transformation, The Hackett Group put together this report that demonstrates all the ways optimizing your AP processes can deliver greater business value. Gain insight into what top performers are focusing on and make the business case for improving AP capabilities by developing a future-proof strategy.